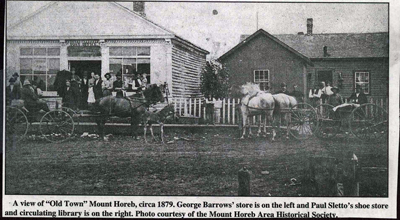 Mount Horeb's first lending library is housed in Paul Sletto's Boot & Shoe Store. The local Kwik Trip sits near the location of Sletto's store. The collection has 150 books. In October of that same year, the American Library Association is formed in Philadelphia. The Minerva Literary Circle, a newly formed club with 12 members (all women), starts a rental library of books from their own collection. The Mount Horeb Library opens in a small bulding in the 200 block of East Main. The Wisconsin Traveling Library Association lends the library 200 books a year for $12. The Minerva Literary Circle raises money for the library by sponsoring food sales, lecture courses, home talent plays, public debate teams, chautauquas & donations. 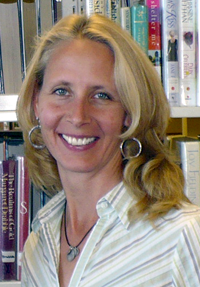 Anna Helland is the librarian and receives no salary. The library moves to the 2nd floor of the Hanley-Reilly garage. The village board assumes responsibility for the library and budgets $100 a year for rent, books, periodicals, and the librarian's salary. The library moves to the Mount Horeb Bank Building, (now the Municipal Building). Anna Helland resigns after 20 years of service & her sister, Marie Eidsmore takes her place. 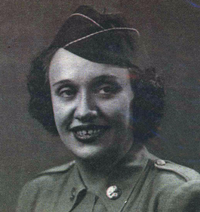 Mrs. Lennie Holum (Elsie) is appointed as librarian. The village board votes to give the library rent-free occupancy of its location. The $360 annual rent is instead to be spent on books. Repair & book mending is done by the inmates at the state prison in Waupun. The library moves to the Evans building on Main Street. Volunteers conduct a Saturday morning story hour for "youngsters." 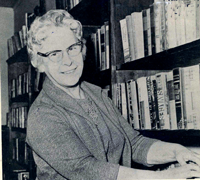 Elsie Holum resigns after 28 years as librarian, and, after a short interim period, Mildred Thousand is appointed to take her place. A small area is set aside for a children's area, apart from the adult books. 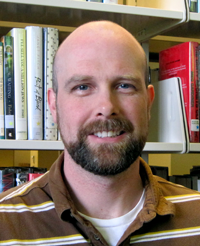 The library becomes a member of the Dane County Library Service. 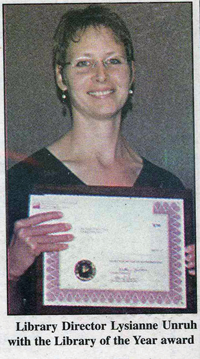 The same year, Friends of the Mount Horeb Public Library is organized by persons interested in developing library services and facilities for the community. Mrs. Thousand resigns and Gladys Martin takes over as librarian. Fifth grader, Randy Swiggum, thinks the library should have a new flag so he writes to Congressman Robert W. Kastenmeier and the library receives a flag that has flown over the U.S. Capital. The library moves to the Gonstead Clinic building on East Main. Library hours are extended to 24 hours a week. The library is appointed repository for the Dahlen collection of 1883 to 1941 "Mt. Horeb Times" newspapers. A record collection is started. Film strips and story hours for children become a regular activity. The library buys a copy machine. The library also acquires a movie projector and schedules Saturday morning movies for school children. The library becomes part of the South Central Library System, allowing it to provide greater services to the community. The library serves 1,042 card holders and 727 Dane County Card holders. 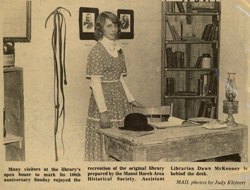 The library celebrates its 100th anniversary. A replica of Paul Sletto's boot shop is created in the library. 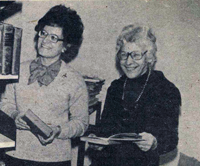 Gladys Martin resigns and Dorothy Handrick is appointed as librarian. The library moves to the upper level of the new Community Center. The library closes for a week to complete the project of barcoding the library collection, making it possible to use scanners to check out materials from the library. LINKcat (Library Interchange Network) an online public access catalog is introduced to the library. Dorothy Handrick steps down as Director and Lysianne Unruh accepts the position. Two internet computers are set up and ready for public use. 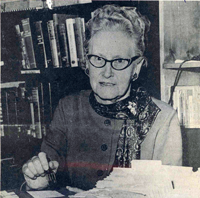 Louise Kindlund leaves 1/3 of her estate to the library. The library begins a new DVD collection with 20 DVDs and a player that can be checked out. The library moves into its new & current location and wins the "Library of the Year Award." The first Death By Chocolate Bake-Off took place with Patricia Morris' German Chocolate Cake taking home the prize. Lysianne Unruh resigns and Brendan Faerty is appointed as the new Director. The library starts a Seed Library where people check out, grow & return heirloom seeds. Over 600 seed packets were checked out! The 10th & Final Death By Chocolate Bake-Off took place with Chrissy Kahl's Raspberry Swirl Brownies winning the overall prize.